It may be rare, but I actually knew I wanted to serve as a Peace Corps Volunteer before I became a member of Alpha Kappa Alpha Sorority, Incorporated. Joy with her graduation cap. Since kindergarten, I’d always been internationally minded, and then a student exchange program to Nicaragua and Honduras confirmed my desire to pursue international development as a career. 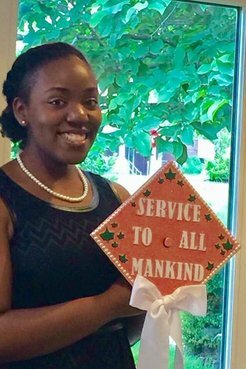 But what Alpha Kappa Alpha gave me was a renewed sense of purpose in my commitment to serve others, no matter the personal cost. In 1908, Alpha Kappa Alpha Sorority founder Ethel Hedgeman Lyle identified eight other women students on Howard University’s male-dominated campus who not only were scholastic leaders, but shared her passion to bring together each of their individual gifts and talents to benefit others. I’m always astonished by the fact that these incredibly talented and outstanding women were only one generation removed from slavery and instead of seeking personal advancement, they sought to create community and mutually uplift others. Joy serves as an Education Volunteer in Mozambique. Learning this history solidified 10 times over my assurance that being a Peace Corps Volunteer was the right decision for me. I knew I wanted to use more than just my skills and talents, but humility and empathy to work hand-in-hand with my host community to bring forth positive, sustainable change. And as an African-American woman privileged enough to have a college education, I felt and still feel the same obligation to honor the sacrifice and struggle that my beloved founders and so many other Black leaders made in order to make my dream (of representing the best of what America has to offer in the land of my ancestors) not just a possibility, but a reality. In sum, I really do love my AKA because our mission to be “supreme in service to all mankind” is what led me to and sustains my work in Peace Corps! 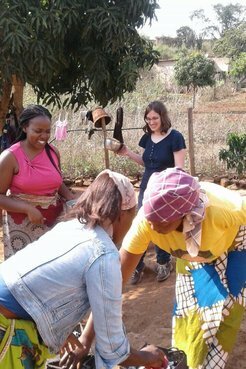 Joy Robertson is an Education Volunteer in Peace Corps Mozambique.